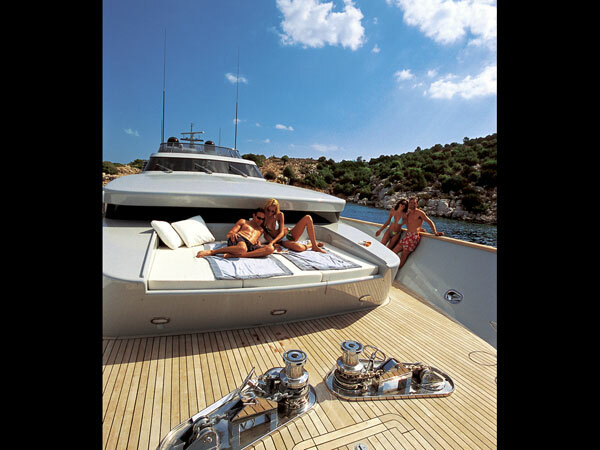 Greece based luxury motor yacht KINTARO is a superb contemporary yacht. 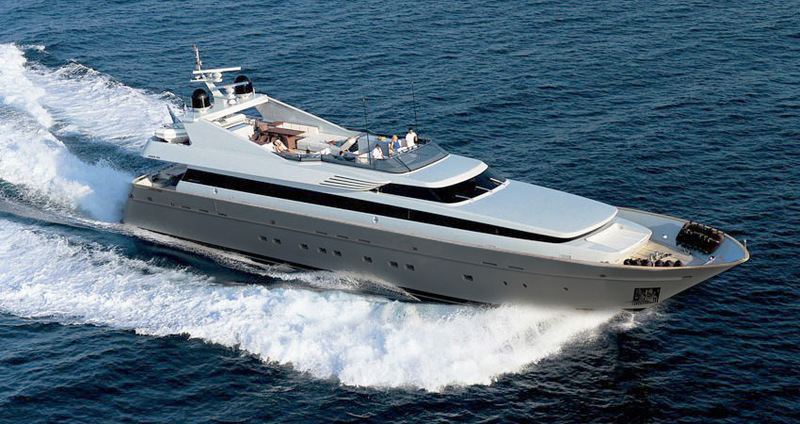 She is very modern, being built by the Italian Cantieri Di Pisa yard in 2005. The yacht received an extensive refit in 2014. KINTARO’s Italian interior and exterior design by Studio Vafiadis, is marked by style, elegance and grace. 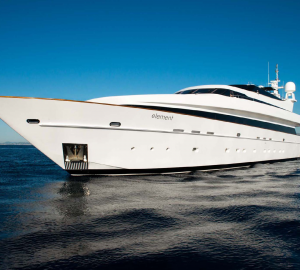 The yacht’s head turning looks are perfectly backed up with by functionality with powerful MTU engines, her top speed of 26 knots and a generous selection of electrical entertainment and water toys. 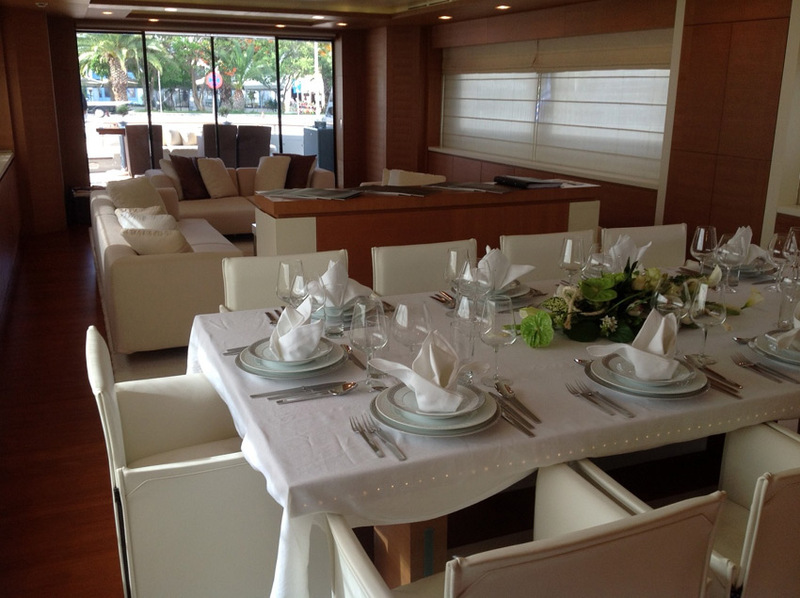 Ideally KINTARO is suited for comfortable accommodation for 10 to 12 yacht charter guests. KINTARO is well set up for a charter vacation and is available for charters in the Eastern Mediterranean around Greece and Turkey. M/Y KINTARO’s salon and dining is a contemporary plan and features a social lounge with plush white sofas and coffee table aft, while forward is the formal dining table. 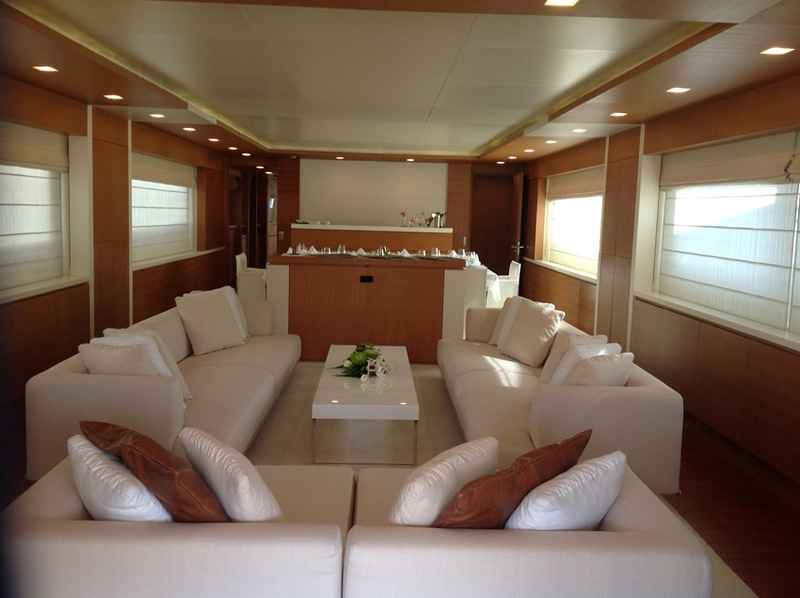 A long port side hall leads to the VIP cabin, followed by the galley and casual dining area. Guest accommodation is accessed from a stairwell prior to the VIP cabin. 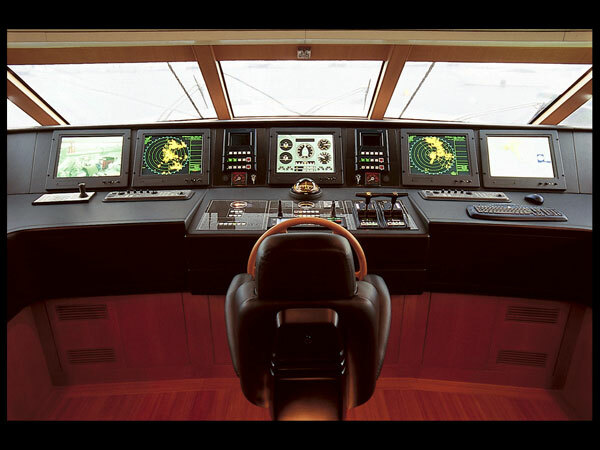 Below decks is a full beam master stateroom with seating area and sofa, 2 double cabins and 2 twin cabins. 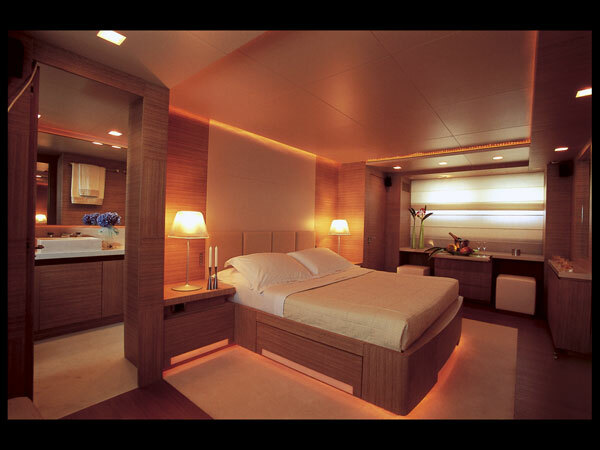 The yacht offers a soothing neutral ambiance throughout, boasting fine woods and high quality finishes. Crewed charter yacht KINTARO is ideal for enjoying the balmy East Mediterranean climates, offering ample exterior living. Aft of the salon, the shaded deck space features an alfresco dining option and plenty of seating. 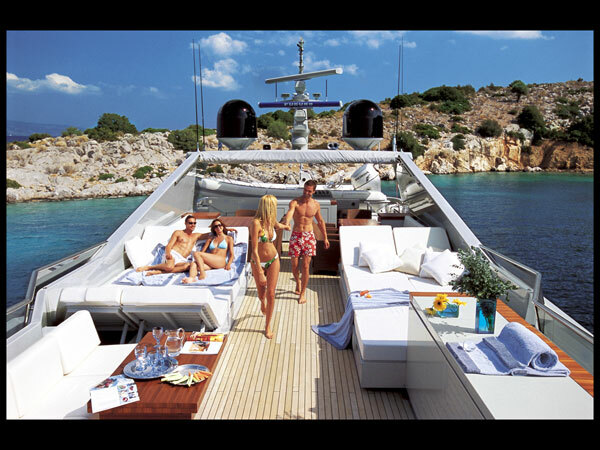 The stern of the yacht folds out, creating a massive swim platform and teak beach. 360° teak decks wrap around the yacht, providing effortless access to the generous foredeck, where a large sunpad and seating area await. The Italian Cantieri Di Pisa yacht KINTARO has a sleek design, thanks to this, she boasts a spacious sundeck, complete with ample sunpads, seating, wet bar and alfresco dining, great for relaxing or entertaining. 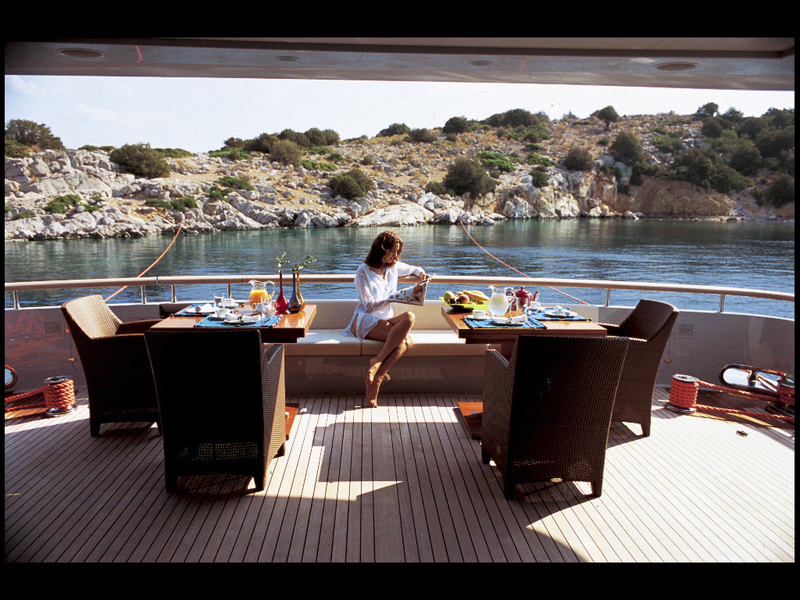 Greece motor yacht KINTARO provides accommodation for up to 12 charter guests in six cabins. The luxurious master suite is on the lower deck, full beam of the yacht with a king size bed, seating area, sofa and large en-suite. 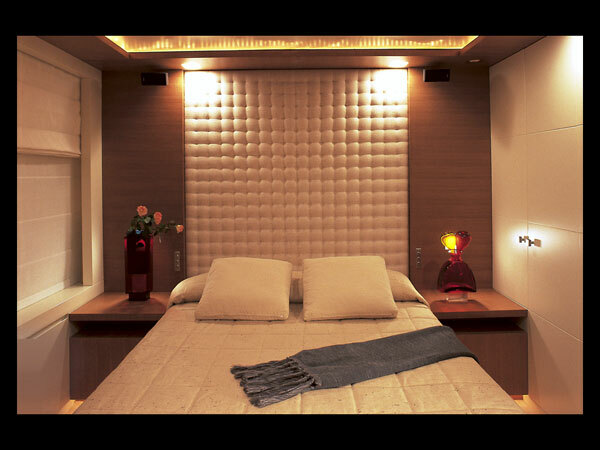 The VIP cabin is on the main deck, forward of the salon, offering a king size bed and large en-suite. Below decks, aft of the master cabin, are 2 double cabins, each with queen size beds and 2 twin cabins, both with side by side single beds and an upper Pullman berth each. All cabins are equipped with TV entertainment and private en-suite facilities.